User's story 4: Health drink | IBE TECHNO CO.,LTD. 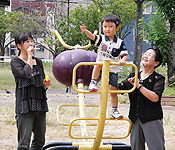 It was eight years ago when Mieko Fukagawa got a license of the second grade care worker. At that time she was 64 years old. She says, "In my youth I wanted to be a nurse but I had to give up because my parents opposed it. I always wanted to work for taking care of people and I challenged to acquire the qualification after my age of 60." Mieko visits houses to work as a helper 4 days a week. She works late at night more than 10 days a month. That must be very hard on her body of over 70 years old. It is a high energy π-water "PINESS" and water from π-water treatment systems that support her daily life. She brings 280ml of bottled water from π-water treatment system with 20-25 drops of "PINESS" whenever she works on the night shift. "When I feel tired and I am lacking sleep, I drink "PINESS," then I feel refreshed and can reset the condition to work well again," Mieko says. In her garden the hydrangea blooms every year. She is looking forward to bring the flowers to the work place every year. "White hydrangea in my garden originated from Kagoshima prefecture. Everybody is pleased to see the flowers. So I will keep the good health by drinking PINESS for the next year." Other members of the Fukagawas are also fans of PINESS. Her son and his wife, and children of them drink PINESS every day. "We call PINESS 'drops.' My 6-year-old elder son Yuta has been a fan of the drops since he was a baby. Immediately returning from the kindergarten he comes to ask me to put drops into water in a cup. One-year-old daughter Yui is always following her elder brother and I expect they shall want 'the drops' together in the very near future." Hiromi, Mieko's daughter in law explained. Yuta takes piano lessons. Now he is applying himself to his practicing for the recital. Beside him Yui sits still with looking up at the piano. "I have a real soft spot for them sitting together," says Hiromi. All members - a grandfather, a grandmother, a father, a mother and grandchildren in the family - drink PINESS every day, The Fukagawas' wellness is supported by PINESS. So are their happy lives, too. ※The contents of the story are based upon interviews in 2009 and 2011.